Unless you unplugged your Internet and shut off your phone this week, you’ve probably heard the tale of Computer Engineer Barbie. I won’t spend too much time recapping it, but we cover it in more depth here. 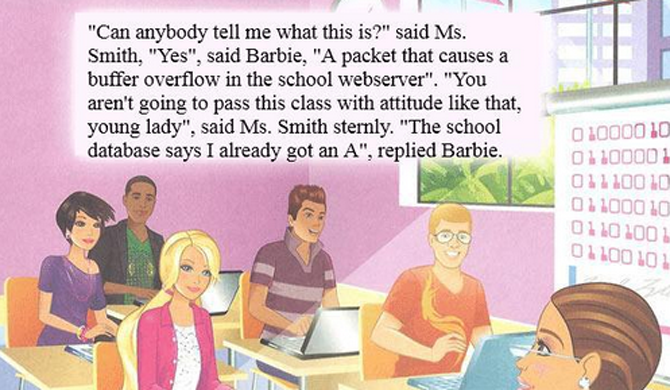 The short version: Mattel publishes a “I Can Be A Computer Engineer” Barbie book. Seemingly intended to encourage young girls to pursue a career in computer sciences, the book instead frames Barbie as something of a damsel-in-digital-distress who turns to her male friends every time something breaks. A few years later, blogger Pamela Ribon reads the book, and rightly slams it for being lame, full of cringe, and not the book that it should be. Anger spreads, Mattel apologizes, and the book gets pulled. But the idea of the book itself isn’t a bad one — it’s the execution that was botched. An “I Can Be A Computer Engineer” Barbie book absolutely should exist — just… not this one. While I’d wager that Mattel is already cracking away at a re-write, it might take a while — you can be damned sure that any replacement book will be vetted a bit more thoroughly than the first one was. Want something sooner? Want to re-write the book yourself, perhaps? Better yet, you could use this tool custom built for the job. Built by coder Kathleen Tuite, the web app lets you remix individual pages from the book to your heart’s content.